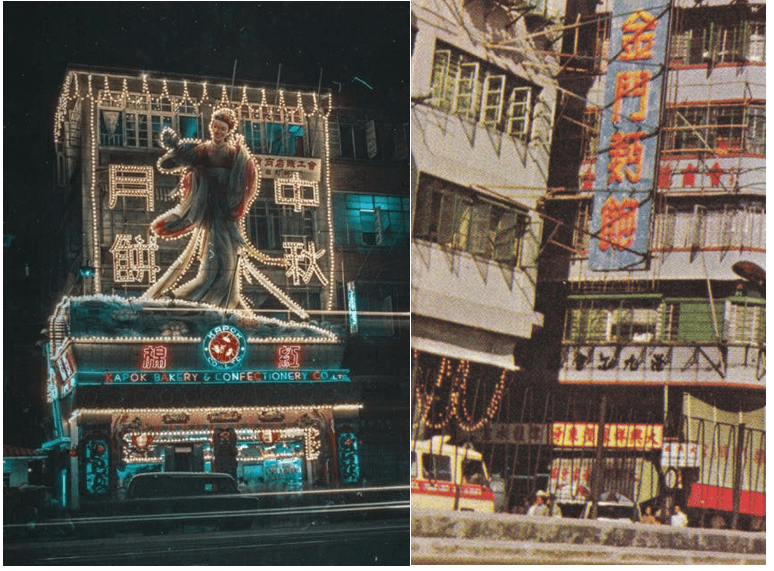 Left: Kapok Bakery in Wanchai in the 1960s with its lighting decorations promoting its Mid-Autumn Festival mooncakes; Right: Golden Gate Bakery’s sign (blue and red) on Jordan Road circa 1968. 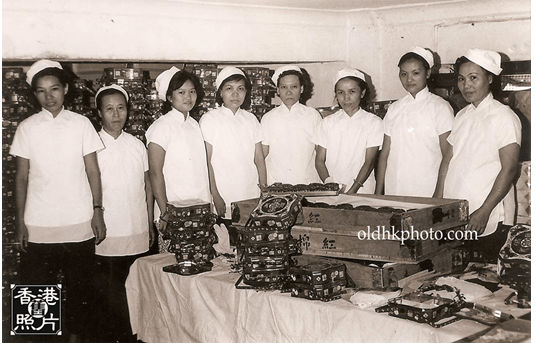 Before the rise of the bakery chains such as Maxim’s, St Honore, KeeWah and Maria’s, Kapok and Golden Gate were two major bakeries and confectioners in Hong Kong the 1950s and 1960swhich had the highest number of outlets at the time (at its peak, Golden Gate had over 45 stores) and pioneered that business model. The two chains were related as they were founded by two brothers – Tang Cheung (鄧祥, 1902-1978) and Tang Kit (鄧傑), whose father Tang Ching-yang (鄧青陽, 1884-1960) was a KMT revolutionary and legislator and they themselves served in the KMT government and military before becoming prominent industrialists and community leaders in Hong Kong and London. A native of Sansui in Guangdong province, Tang Ching-yang studied law at Meiji University in Japan where he joined Sun Yat-sen’s revolutionary organization Tong Meng-hui. When the revolution succeeded in 1911, he was one of the representatives from Kwangtung in the Nanking assembly which elected Sun Yat-senas provisional president of the new Republic. He was involved in the founding of the Kuomintang and stayed involved with KMT politics as a member of Legislative Yuan and other capacities until his death in Taipei in 1960. According to his obituary, he had 4 sons and 9 daughters and the Tang brothers profiled in this article were the sons from his first wife. Among his daughters the most prominent was Tang Pak-nu (鄧不奴, 1903-? ), one of the first female lawyers in Kwangtung who was also a headmistress (including being the first principal of Po Kok Primary School in Yuen Long from 1958-1963), head of numerous women’s groups organized by the KMT and delegate to the National Assembly. Pak-nu’s husband Hui Sung-nin (許崇年) was a KMT official and scion of the “First Family of Canton” which included many prominent figures such as his brother Hsu Chung-ching, the president of Sun Yat-sen University and his cousins Hsu Chung-chih, high ranking KMT general and Hsu Kwong-ping, the wife of literary giant Lu Hsun. Tang Cheung, who also went by the name TangHak-yat (鄧克一), graduated from the National Sun Yat Sen University in Canton. During the Northern Expedition in the 1920s, he worked in political propaganda for the Fifth Army and later served in various provincial government posts in Kwangtung including head of the Harbor Authority of his native Sansui and head of Yingde prefecture. He was also elected to the state senate of the Kwangtung province and served as delegate to the National Assembly from its inception in 1947 until his death in 1978. After the KMT regime lost power in the mainland in 1949, Tang Cheung did not follow his father to Taiwan but moved to HK where he had established Kapok Bakery in 1938. The main store and factory of Kapok had been located atits own property at 310-312 Hennessey Roadin Wanchai (next to the current CC Wu Building) since before the War as evidenced by an eviction lawsuit filed in 1941 by the firm against a tenant on the second floor by the name of To Wing who owed over five months of rent. After the War, Kapok continued to operate out of Wanchaiand also had at least one Kowloon branch at 32-48 Lai Chi Kok Road. In 1954, Tang Cheung incorporated Kapok Bakery & Confectionery Co Ltd (紅棉麵包餅乾糖菓有限公司) with HK$1 million in capital. The firm was particularly known for its mooncakes and bread and the firm began exporting its mooncakes to the US and Europe – first via shipping through American President Lines in 1957 and later via airmail through a partnership with Pan American Airways and General Travel Services in 1961. Its bread was also very popular thanks to some innovative designs (for example one of the popular items was a bread that shaped like an airplane) and those who grew up in the 1950s and 1960s had fond memories of the firm, with the famous columnist Chip Tsao counting Kapok’s Wanchai store as part of his cherished memory of growing up in HK and in a piece Electoral Affairs Commission chair Judge Pang Kin-kee wrote for the DBS Class of 64 Golden Jubilee booklet, he mentioned that back in the 1960s “Where do you get your bread? Kapok, of course”. In 1956, Tang Cheung’s son Jimmy Tang Hing-chung (鄧慶鐘, 1931-) returned to HK from the US after receiving his MBA from NYU and completed his undergraduate studies in chemistry. In addition to Kapok, he also worked for Connell Brothers, the American trading firm which represented a wide range of products in the Far East ranging from Eagle condensed milk to Kraft cheese to heavy equipment. In 1957, he and his father and four other members of the Chinese Manufacturers Association (Tang Cheung was a director of the CMA) including the preserved ginger king U Tat-chee visited the New York Expo. Tang Cheung was also business partner of U Tat-chee as he was vice chairman of YauYatChuen Development Co and lived at 11A Tat Chee Avenue in YauYatChuen with his wife Ma Hon-yiu. He was also involved in Kapok Soy Cannery, which had its factory in Fanling and exported its products overseas. Outside of business, Tang Cheung was very involved in community affairs in HK, having served as director of the Tung Wah Group of Hospitals in 1955 and chairman of the Tang Clansmen Association, the National Sun Yat Sen University Alumni Association and the bakery and confectionary industry groups. Given his KMT background, he was particularly interested in relief for refugees from the mainland and often offered jobs at Kapok to refugees. One of these refugees was Szeto Yu-fan (司徒汝蕃), who worked for Kapok for 7 years before founding the popular snack shop Yiu Fung (么鳳) in 1960. In 1978, Tang Cheung died at the age of 76 at the Baptist Hospital in Kowloon. His granddaughter Camille Tang was married to Kent Yeh of Taiping Carpets and is currently CEO of Convenient Power, which develops wireless power solutions. As a firm, Kapok Bakery was dissolved in 2002. Tang Kit, who also went by the name of Tang Shui-kung (鄧萃功), studied at Lingnan University in Canton, Fudan University in Shanghai and was a graduate of the 18th class of the Whampoa Naval Academy in Canton.He furthered his studies at the Royal Naval College in the UK where he became an expert on destroyers. He returned to China where he became the commander of the 4th destroyer of the fleet of the Guangdong warlord General Chen Chitang (see article on Union Metals Work). In July 1936, Tang Kit and 3 other Guangdong destroyer commanders defected to Chiang Kai-shek’s central government and sailed his destroyer to HK. Together with Soong Ta (宋達, father of KMT politician James Soong), Tang Kit developed a torpedo which contributed to KMT defense in the Battle of Wuhan during the Sino-Japanese War in 1938. Like his brother, he entered the private sector and served as managing director of the Fu Wah Sugar Refinery in Jiangmen and a commercial fishing firm before founding Golden Gate in Hong Kong. Golden Gate was founded in 1950 anda CMA directory in 1958 listed the firm’s factory and office at 79-81 Bedford Street in Tai KokTsui at the time. In 1962, Tang Kit incorporated Golden Gate Food Factory Co Ltd (金門食品製造有限公司), which was renamed Golden Gate Foods the next year. Golden Gate grew very rapidly in the 1960s, with 40 stores by 1966 and 45 stores by 1969, which was a record in HK business history at the time. The rapid expansion of Golden Gate was backed by an interesting rental strategy where the firm leased retail spaces in street corners with good traffic flow. Golden Gate only used the very tip of the corner and sublet the rest to other retailers and the rental income alone was enough to subsidize the operation of the branch. Since the stores were small in size, they usually came with giant neon “Golden Gate Bread” signs in the exterior of the building for promotion purposes and in 1963, tenants of the 3rd, 4th and 5th floor of Lee On Building at 56-61 Argyle Street in Mongkok filed a suit against Golden Gate to remove its 40 feet sign which affected their flats since 1959. By 1966, Golden Gate had centralized its production in a 6-story industrial building they built at 46 Lai Yip Street in Kwun Tong which was fully automated and Tang Kit also attended the first International Packaging Convention in Tokyo that year with Fung Kam-chung from Chee San & Co to study the latest packaging technology. 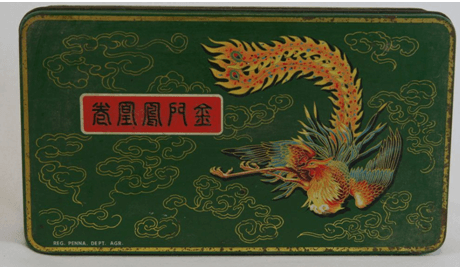 Like Kapok, Golden Gate was also in the mooncake business whose sales during the Mid-Autumn Festival was enough to cover the firm’s operating expenses. Aside from baked goods, it also manufactured fish and other seafood and oyster sauce. By the late 1960s, Tang Kit had migrated to Europe where he was elected chairman of the British Chamber of Commerce in London in 1969 and established a trading center in Germany. 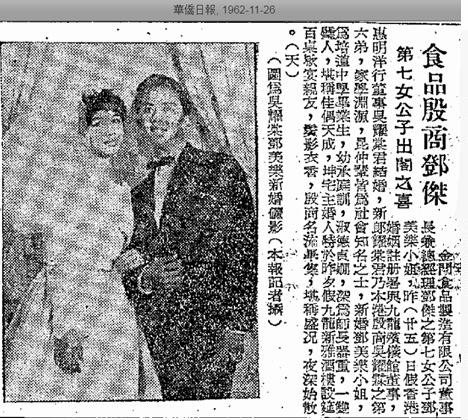 His seventh daughter Tang Mei-lok (鄧美樂) marriedNg Yiu-tong (吳耀棠), the sixth son of the founder of Kowloon Funeral Parlor and brother of comedic actor Richard Ng Yiu-hon in 1962. In recent years, Ng has been an active spokesperson for the HK funeral service industry as the founding chairman of the HK Funeral Business Association. The soaring rent and real estate prices in HK in the 1970s killed the Golden Gate rental strategy and one by one, the Golden Gate bakeries closed. As a firm, Golden Gate Foods was dissolved in 1995. This article was first posted on 8th October 2018.